daughters and 1 grandson. Caz and Jane married in 1980 after being high school sweethearts. 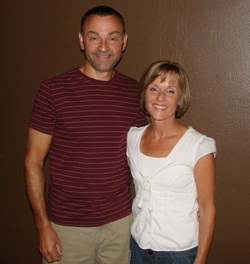 Both of them received Christ while attending South Tama High School. Their journey with Jesus led them to become part of both mainline churches and several Vineyards. After moving their family to Newton from Monticello, they became involved in a Missionary Alliance Church where they were staffed as worship pastors and overseers of small group ministry. “In January 2007, we felt we were being called to take the message of Jesus beyond the four walls of what we mistakenly called the church. We had grown incredibly in our faith while being at CMA , but we knew we had to be obedient to what God was asking of us. Although the decision to leave our church family was agonizingly difficult, we sensed God was calling us toward a simple and quiet work. Not better than other churches, but different. We could no longer ignore the call. Haven Vineyard Church was birthed out of this heart. We have experienced what it means to be intimate with God through worship, prayer, and His word. We can never settle for less than a growing-deeper kind of relationship with Jesus. By the power of the Holy Spirit we move out- weak but confident in Him.